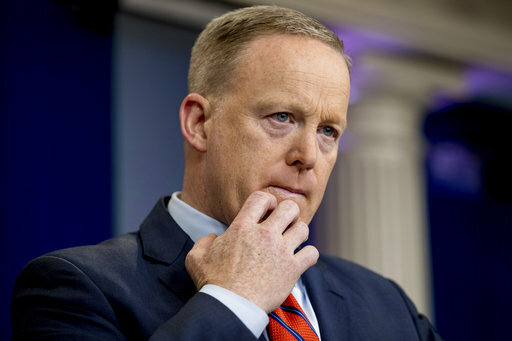 WASHINGTON (AP) — White House Press Secretary Sean Spicer said Tuesday that Adolf Hitler “didn’t even sink to using chemical weapons” — a comment at odds with Hitler’s extermination of Jews during the Holocaust using gas chambers. It immediately inspired calls for his firing from the Anne Frank Center for Mutual Respect and other Jewish organizations that accused him of engaging in Holocaust denial. “Sean Spicer now lacks the integrity to serve as White House press secretary, and President Trump must fire him at once,” Steven Goldstein, the Anne Frank Center’s executive director, said in a statement. Even Chelsea Clinton weighed in, saying on Twitter she hopes Spicer will will the National Holocaust Museum. “It’s a few blocks away,” Clinton added. Spicer was attempting to discuss the horror of the chemical weapons attack last week in Syria that the administration is blaming on President Bashar Assad. Minutes later, Spicer delivered a garbled defense of his remarks in which he tried to differentiate between Hitler’s actions and the gas attack on Syrian civilians last week. The attack in northern Syria left nearly 90 people dead, and Turkey’s health minister said test show sarin gas was used. “I appreciate the clarification. That was not the intent,” he said. It was the second day in a row in which Spicer appeared to have trouble articulating the president’s foreign policy at a critical time. The comments came a day after the White House was forced to walk back remarks Spicer made from the podium that the use of barrel bombs by Assad’s government might lead to further military action by the United States. Until Monday the administration had maintained that last week’s airstrikes was in response to the Syrian government’s use of chemical weapons against its own citizens. A White House spokesman said later that “nothing has changed in our posture” and the president retains the option to act if it’s in the national interest.